All I can say is Wow! 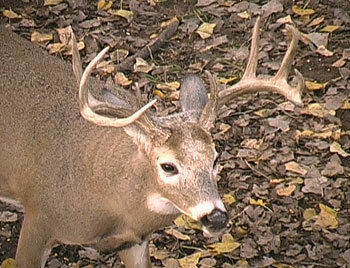 I was not in my stand 15 minutes when a buck showed up. It was dark, and the pink light was just illuminating a portion of his horn. As the light increased, he was a small buck. 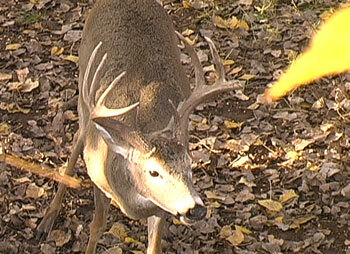 But then, a much larger buck materialized beneath my stand and chased the smaller buck off. There was plenty of shooting light, and he looked like a hawg, but I decided to pass on him. He fed for a few moments then headed into the trees. After the sun had completely cleared the horizon, several does filtered off the fields. 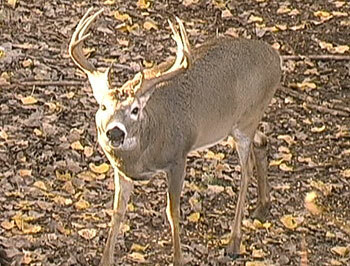 A few minutes later, the big boy that was under my stand in the near darkness was heading in. He chased the does around a bit, then fed just a little. 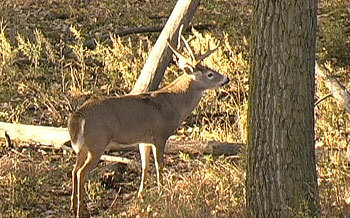 He stayed with the does for at least 15 minutes before working a line of scrapes back into the trees. 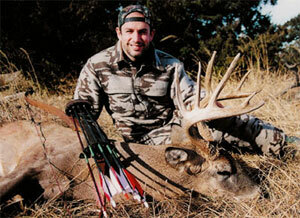 I had several opportunities to shoot him, including several shots between 10-20 yards. But I just couldn't do it. He was definitely a shooter, but heck - it was just the first morning! I hate tagging out early. I passed on him. I sat in my stand finding words that best described how stupid I was for passing on that big 9 point when a group of does headed toward my stand. It was now about 8:15 AM and all three were adult does. They kept looking over their shoulder and I knew why. 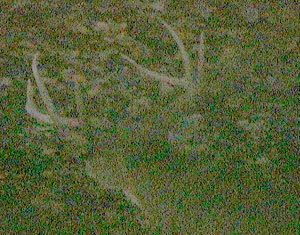 Another big 9 point, this one probably bigger than the earlier buck, followed these does toward my stand. I had to really think about this buck. He had great tine length and was very tall and stacked. But he was missing spread, and I decided, once more, that I would hold off. Now, either of these bucks would make me extremely proud and I would never have regretted shooting them, but I knew I would have deprived myself of 11 potential hunts here and that was enough to keep my bow on the tree. I will likely regret today - but I'm OK with that. I've only displayed the two big bucks from this morning. In all I saw 5 bucks and ten does. It was simply an incredible morning and a super start to my annual Kansas Deer hunt. 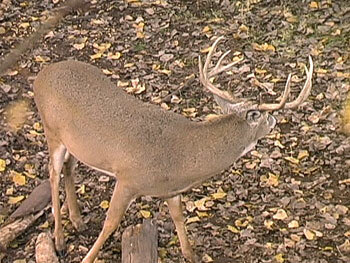 The wind is picking up and it's getting warmer, hopefully the afternoon hunt will bring as much action. It doesn't get much better than this! Got into the stand around 3 PM and the wind was whipping through the cedars. I knew it would be slow and I was right. As the sun went down, a lone doe came by my stand and fed around. By the time it was dark I had lots of deer and at least 1 buck. I could see his horns and he was smallish, probably around 110 gross. He chased the does pretty hard until it was too black to see. I believe a 2nd, bigger buck showed up by the sound of his grunts - they were deeper and more robust than what I had heard from the small buck. But there was no way to be sure. It was black out by then. The deer ran around until Kent came and picked me up. 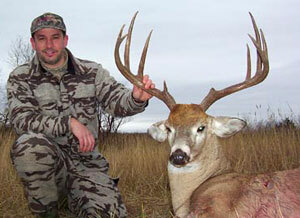 Ron Baxley saw a real big buck, but it was too far off to shoot. And Kyle had two bucks fight in front of his stand - but they were a little smaller than he wanted. All in all, a very good day. We appreciate you playing along with our first Treestand Placement Challenge. Here's the answer. The first day, a doe fed in towards the stand from the East. She came from the swamp, not the normal route. She headed straight for the acorns and Bill Gaunt drilled her. The second day, a lone doe followed her normal patterns, coming from the fields to the North, She made he way along the trail which follows the river, passing by my stand where I double lunged her as she fed on acorns. We were both hunting stand six. The acorns along with a favorable wind made this stand a no-brainer. Most of the responses we read were correct. Good job! 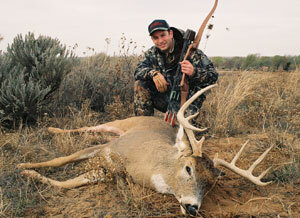 Our annual hunt at Cimarron has become a Bowsite.com mainstay. We are hoping for this one to be as exciting and productive as the last four hunts - despite the weather forecast which is calling for some HOT weather over the next few days. 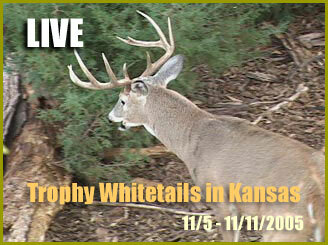 Just like before, we will be bringing you this hunt LIVE from Kansas.